Since the atomic bomb made its first appearance on the world stage in 1945, it has been clear that we possess the power to destroy our own planet. What nuclear weapons made possible, global environmental crisis, marked especially by global warming, has now made inevitableÂif business as usual continues. The roots of the present ecological crisis, John Bellamy Foster argues in The Ecological Revolution, lie in capitalâs rapacious expansion, which has now achieved unprecedented heights of irrationality across the globe. 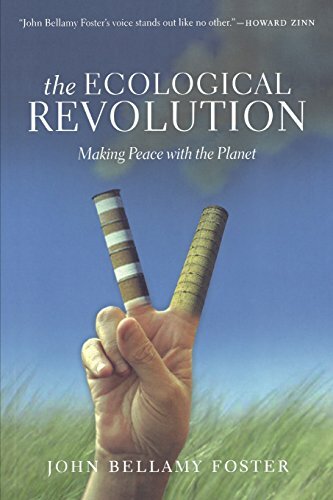 Foster compellingly demonstrates that the only possible answer for humanity is an ecological revolution: a struggle to make peace with the planet. Foster details the beginnings of such a revolution in human relations with the environment which can now be found throughout the globe, especially in the periphery of the world system, where the most ambitious experiments are taking place. This bold new work addresses the central issues of the present crisis: global warming, peak oil, species extinction, world water shortages, global hunger, alternative energy sources, sustainable development, and environmental justice. Foster draws on a unique range of thinkers, including Karl Marx, Thomas Malthus, William Morris, Albert Einstein, Hannah Arendt, Rachel Carson, Vandana Shiva, and IstvÃ¡n MÃ©szÃ¡ros. The result is a startlingly radical synthesis, which offers new hope for grappling with the greatest challenge of our age: what must be done to save the earth for humanity and all living species. About: Since the atomic bomb made its first appearance on the world stage in 1945, it has been clear that we possess the power to destroy our own planet.